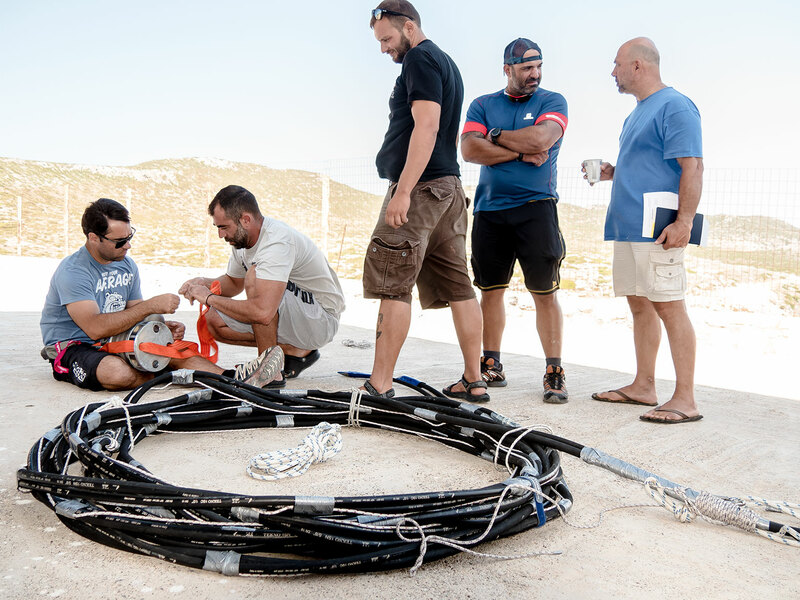 OTE-COSMOTE is the expedition’s telecommunications provider, connecting the team with the outside world. 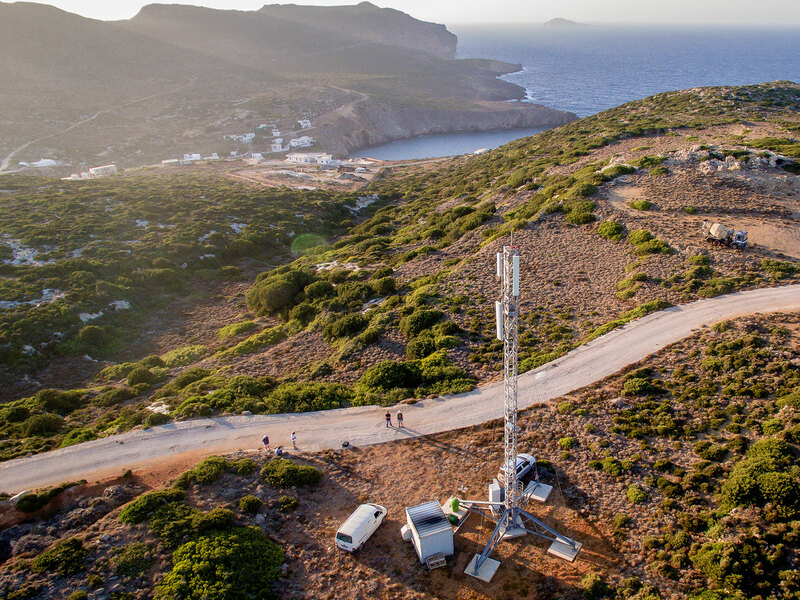 To support the project, OTE-COSMOTE installed two new cell phone towers last year on Antikythera. One is near the island’s largest village, Potamos, and the other overlooks the shipwreck site. 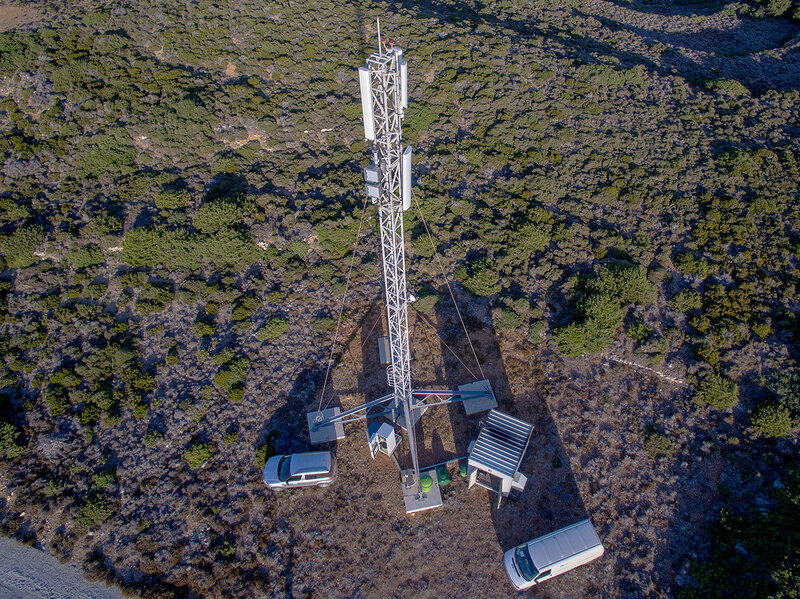 Beyond project needs, this provides better (and much faster) connectivity for the island in general. 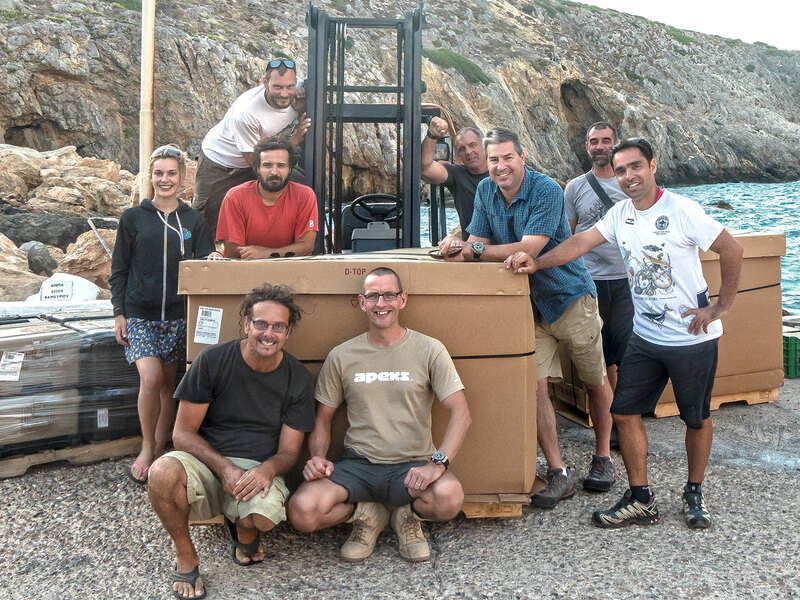 It’s great that the Return to Antikythera project can provide such a legacy for Antikythera, in association with OTE-COSMOTE. 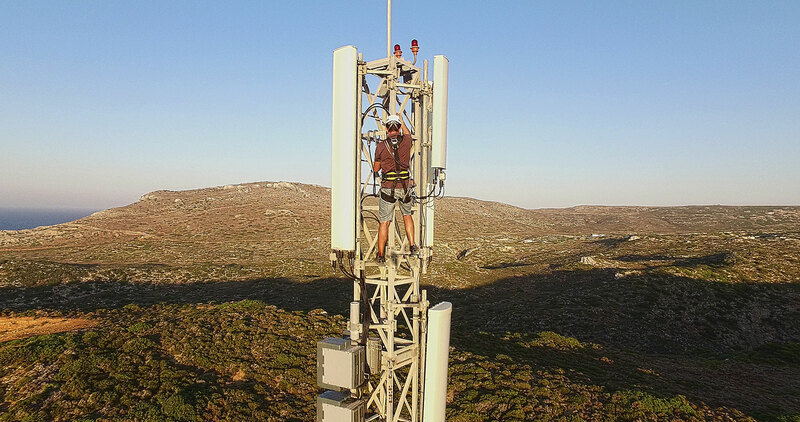 Here’s some photos taken by one of our drones of the tower that serves Potamos. We’re away! 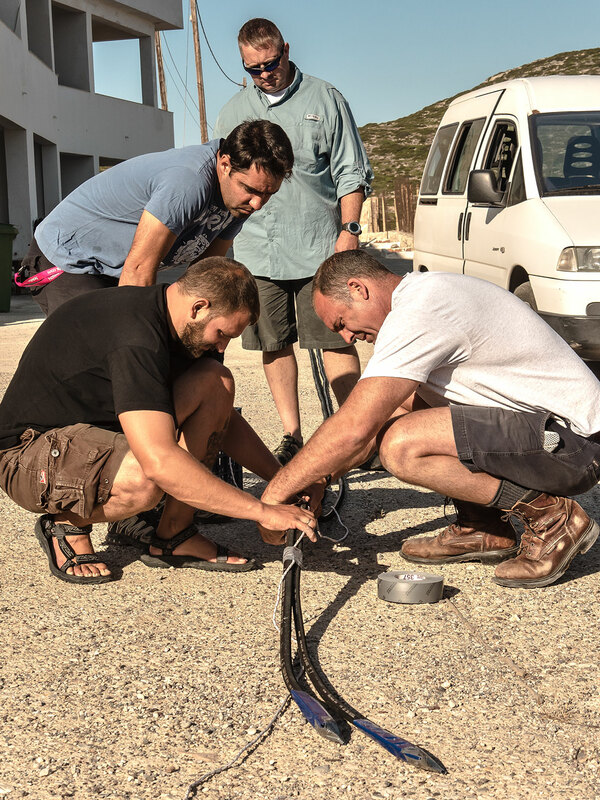 The first dives of the expedition took place in Antikythera yesterday, with all of the team doing shakedown dives and practising drills. 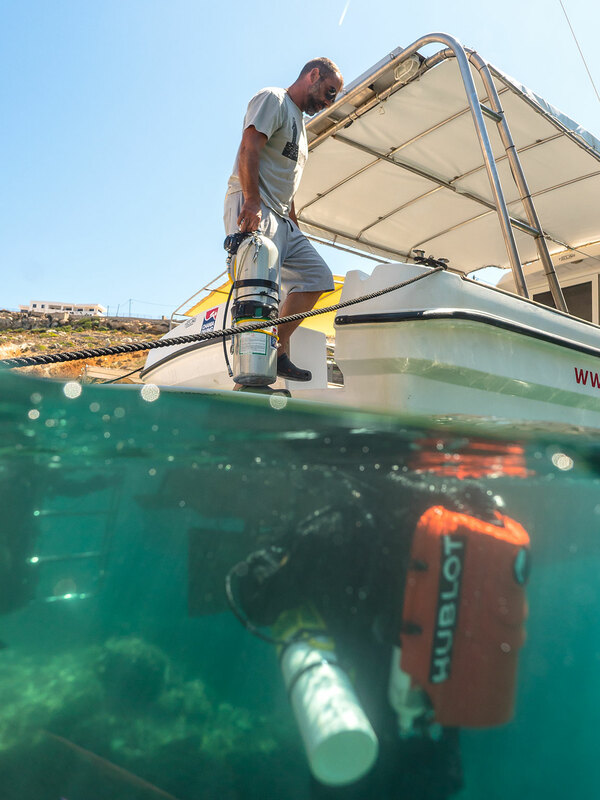 It’s important to test equipment in a more controlled environment than on the Antikythera shipwreck, before underwater archaeology can begin. 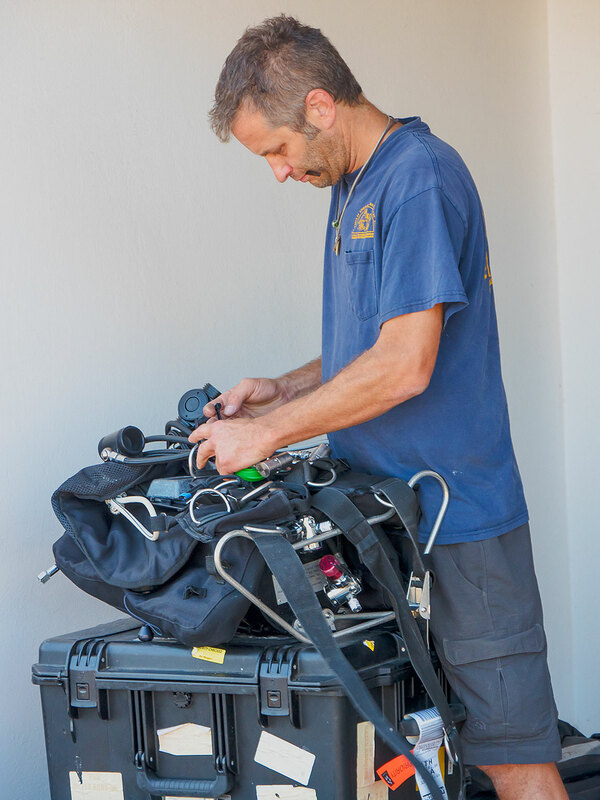 Working at depths greater than 50 metres is serious business, so operating safely is paramount. The next step will be for lead divers to set up moorings and lower dredging equipment near the wreck, which is expected to take place tomorrow and Tuesday, subject to weather. Everything’s going to plan, and as you can see from the web journal so far, a lot of preparation is required before excavating can begin. 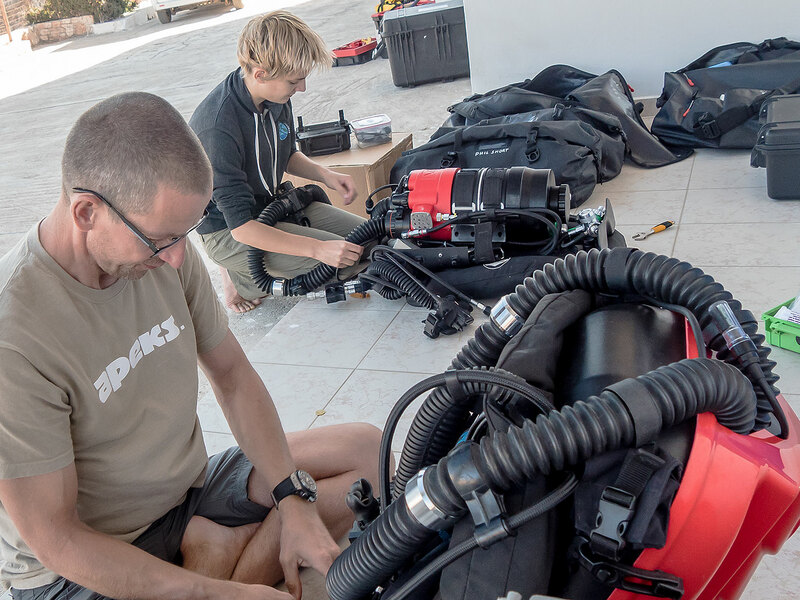 The majority of divers in the project will be using rebreathers, which are different from standard scuba kit – where exhaled breaths are recycled in a ‘closed circuit’ system, filtered, with a touch of oxygen added, and ‘re’-breathed. 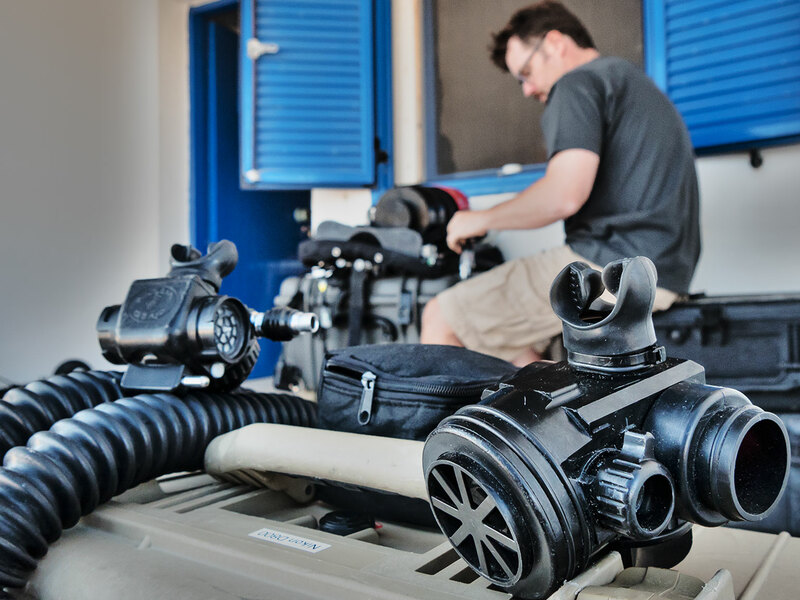 This is a lot more efficient than standard Scuba kit, meaning that less breathing gas is needed per diver and optimal breathing gasses can be inhaled. 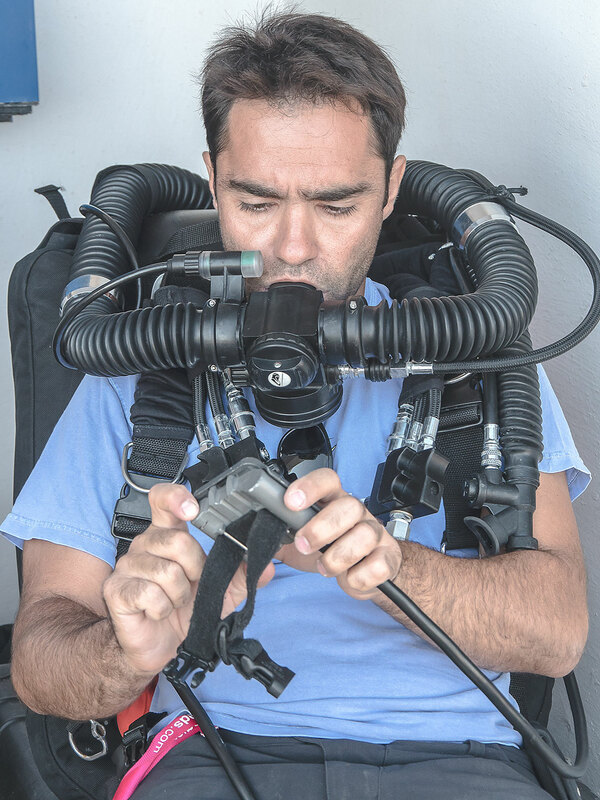 Divers breathe a special gas mixture, commonly known as Trimix because at depths deeper than 50 metres, a gas mix including helium is better so that some of the nitrogen and oxygen we normally breath in air is removed, because of undesirable properties under greater pressure. 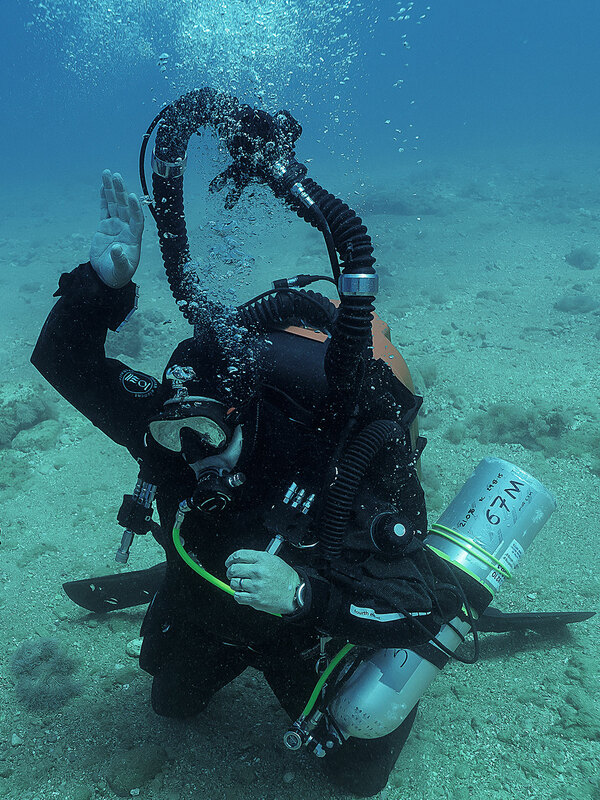 Too much nitrogen at depth leads to a phenomena called nitrogen narcosis (aka. raptures of the deep), with similarities to being intoxicated, impairing the diver’s ability to work underwater. 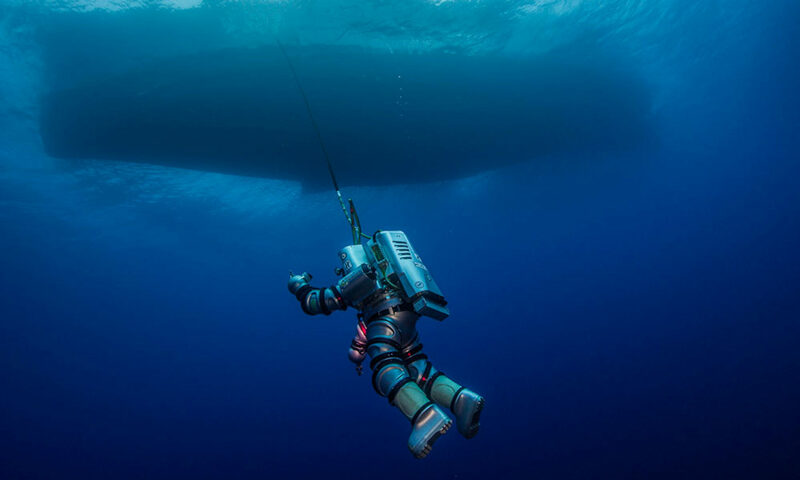 Sponge divers who recovered statues and the Antikythera mechanism in the early 1900’s breathing air pumped from the surface would have suffered a lot while working. 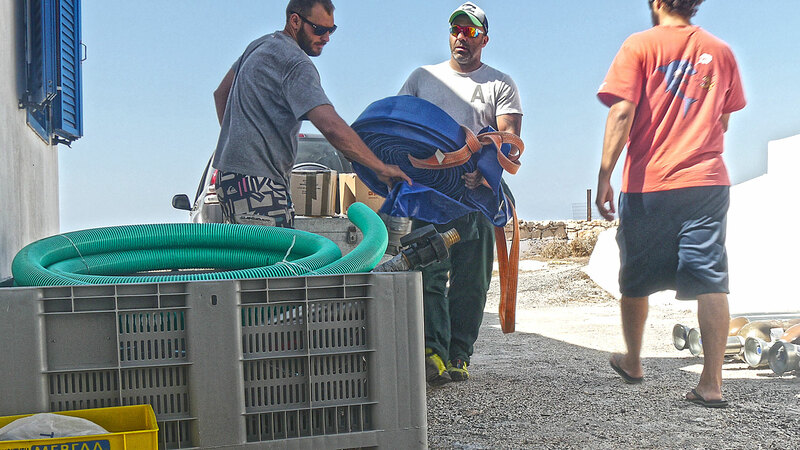 Another piece of equipment being prepared today is the underwater dredge, a suction system that will be used to carefully excavate parts of the shipwreck that are buried in the sand. The plan is to set up an underwater grid and create associated trenches, to systematically remove pockets of sand. It could take years to excavate the entire site, so a systematic approach allows work to take place in a modular way. Everything found will then be logged onto a detailed map/chart, to indicate the spatial relationship between items recovered. 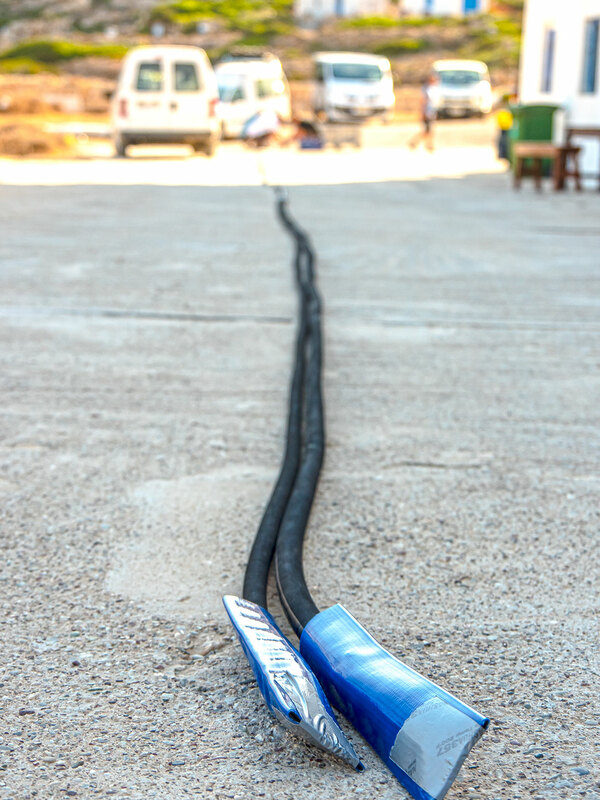 Over 70 metres of hoses are needed for the underwater dredge. 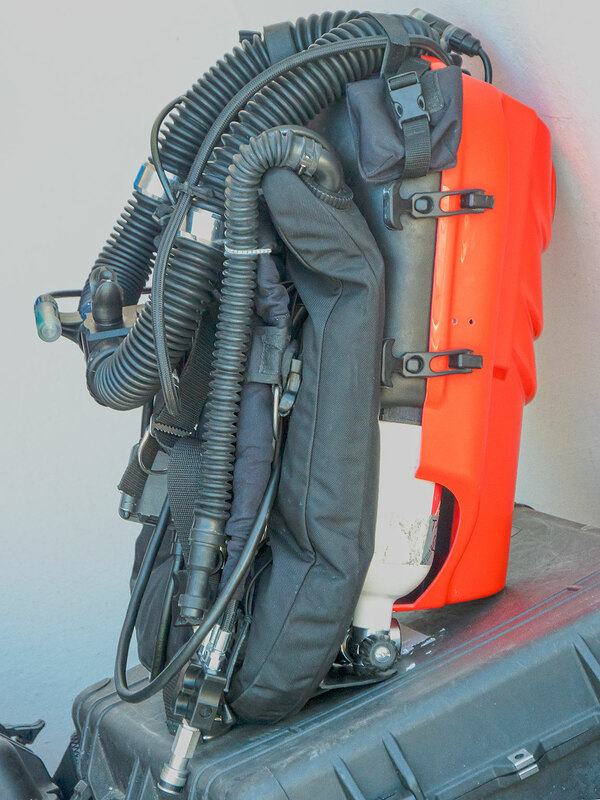 This is the VMS Sentinal rebreather that most of the team is using. 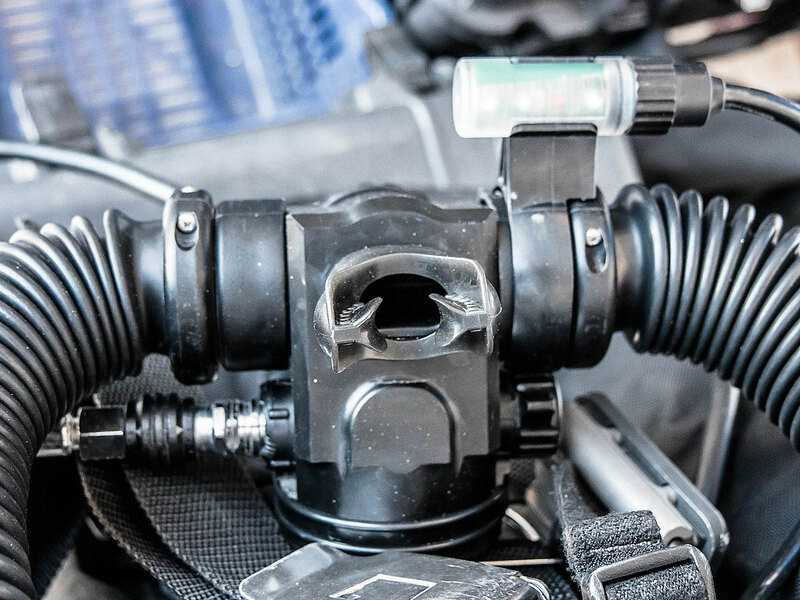 Notice the twin hoses connected to the mouth piece in the middle. Gas breathed comes in from one hose, and is exhaled and ‘recycled’ through the other. 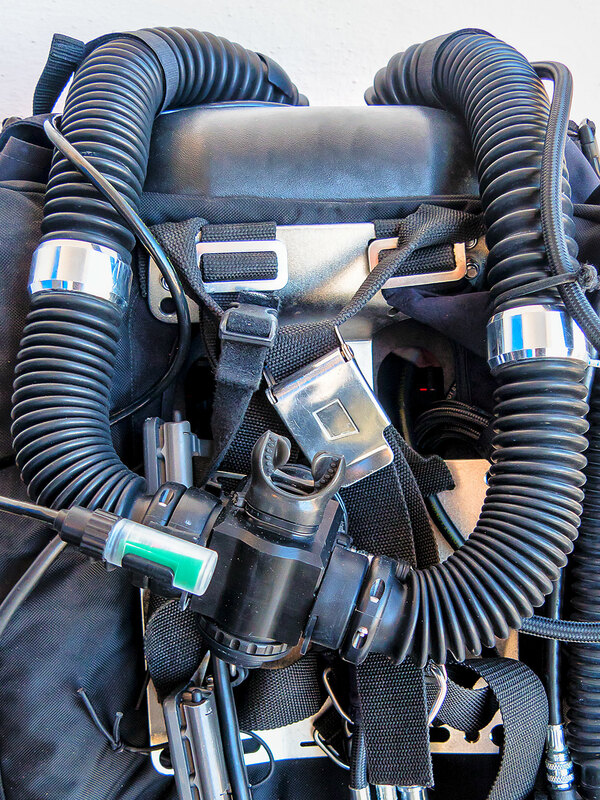 And a view of the twin hoses from the other side, with the mouth piece that the diver breathes through, in the centre. 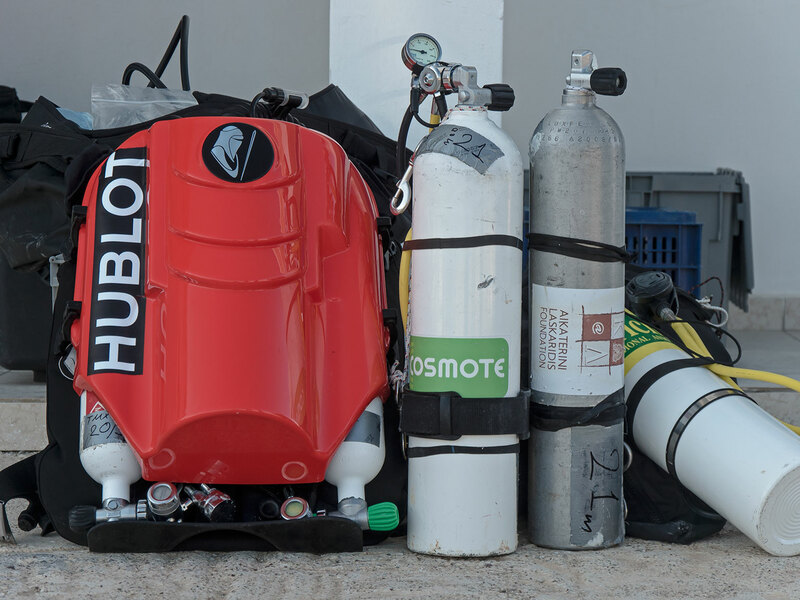 The clear cylindrical object at the top right displays warning and status lights throughout the dive. 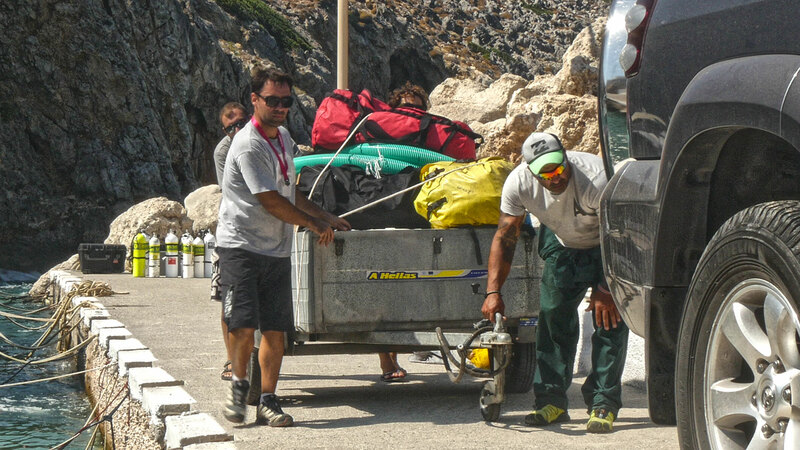 Preparation is in full swing, as all the equipment has now arrived at the main compound. 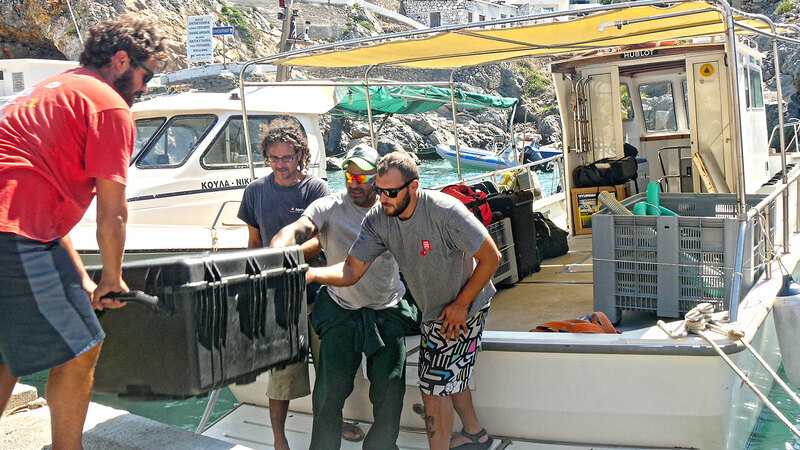 Members of the dive team are unpacking and assembling their equipment, filling cylinders and testing kit. Briefings are taking place so that team members from Greece, the United Kingdom, America, Sweden & Australia work cohesively as a group. Also assembling smaller sub teams. 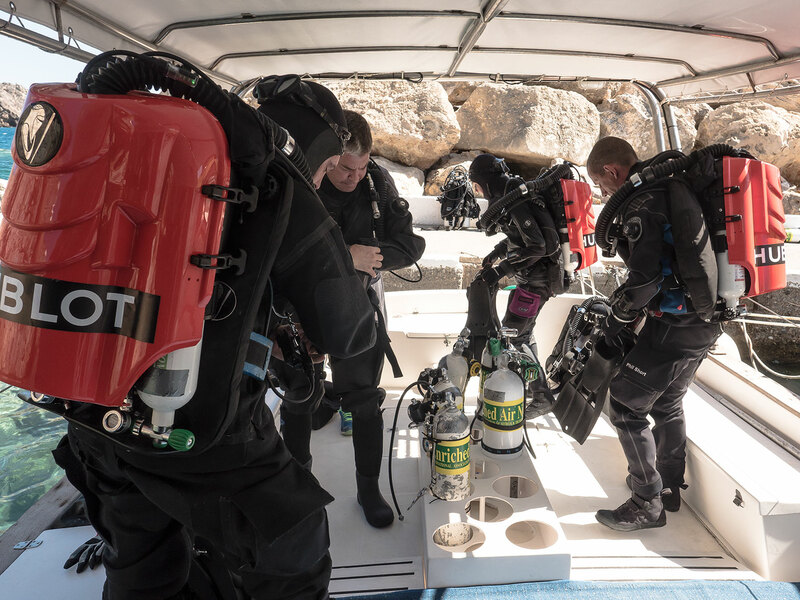 Everyone has their own specialty, plus a lot of common skills, such as technical diving expertise. 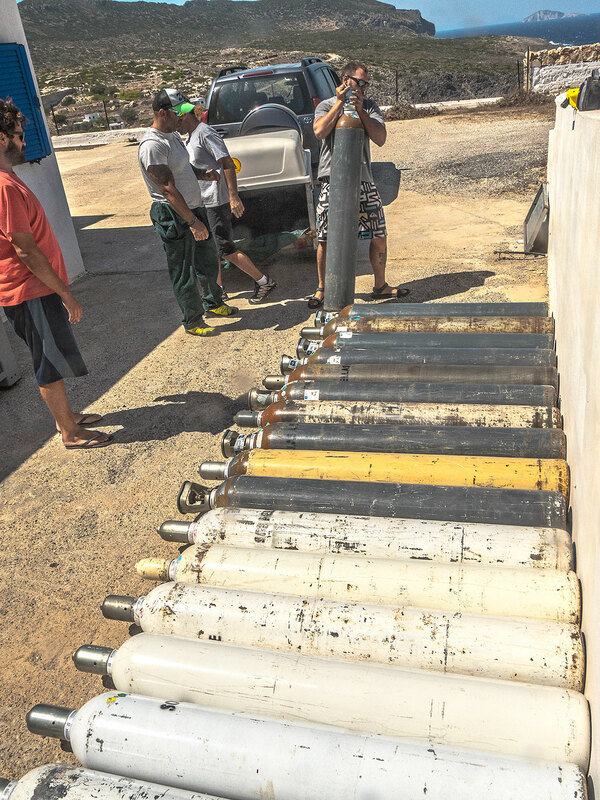 Something that isn’t generally mentioned in stories about the project is that addition to scientific and technological challenges, logistics are difficult and expensive. 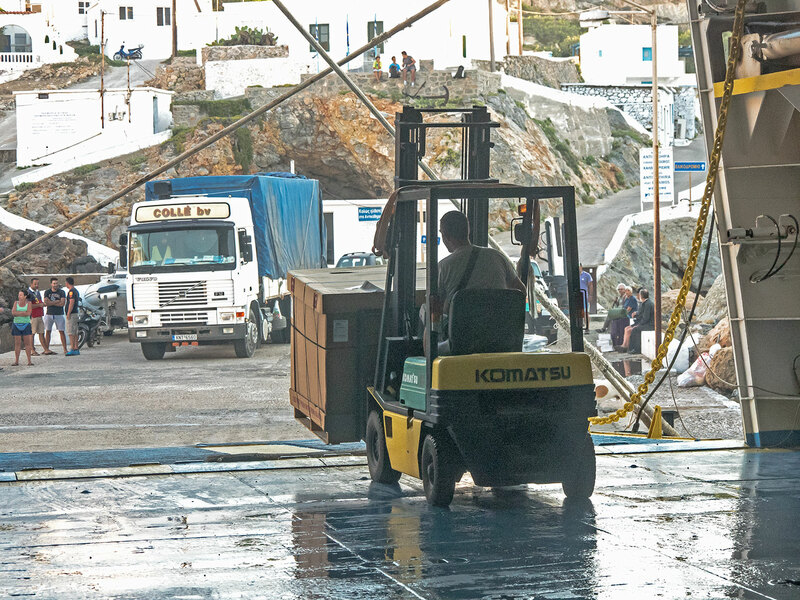 Tonnes of equipment has to be brought to Antikythera for the duration of the project and then returned, even a rented forklift. 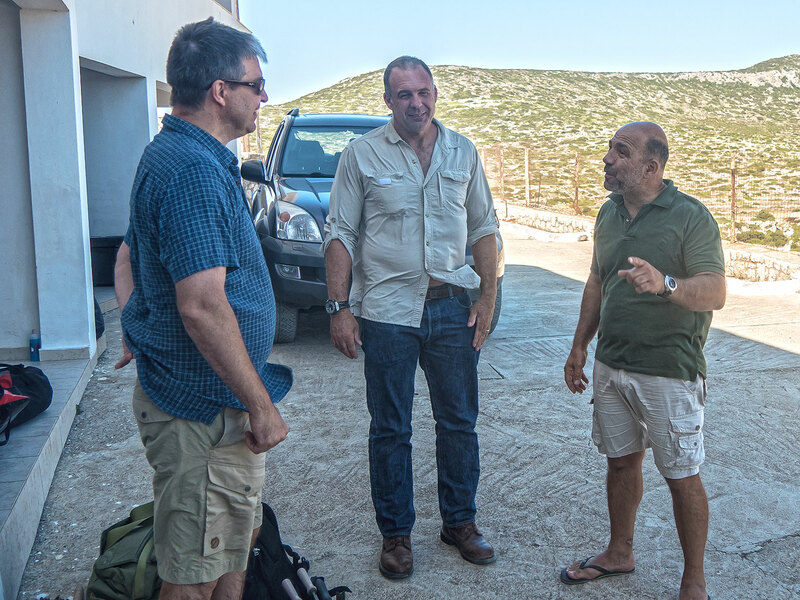 Then there’s the human element, 20-30 people have to be accommodated and fed (a number greater than the permanent population of the island), a temporary dive centre needs to be set up, organising supporting vessels, plus scientific infrastructure and so on. The project is a massive production! 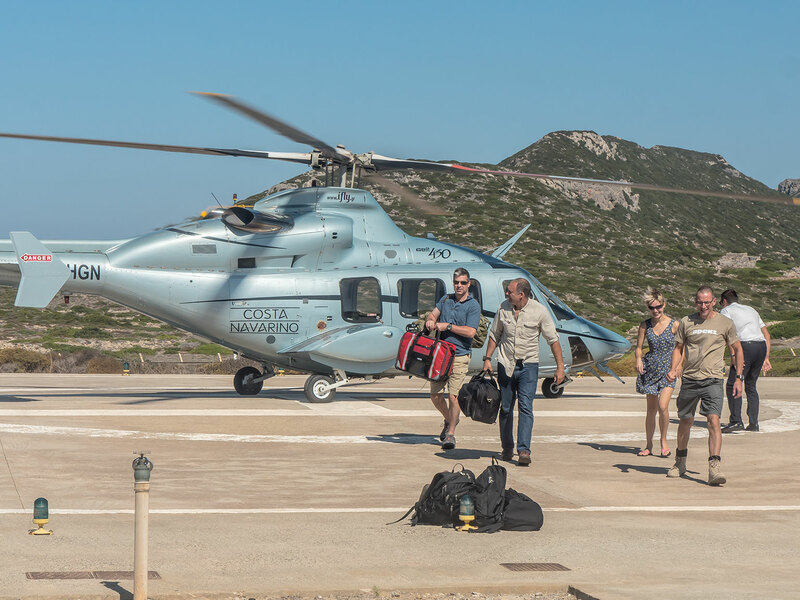 Team members have been arriving in Antikythera from around the world over the last few days, using all modes of transport ranging from the standard ferries, to a helicopter transit provided by our good friends at Costa Navarino. 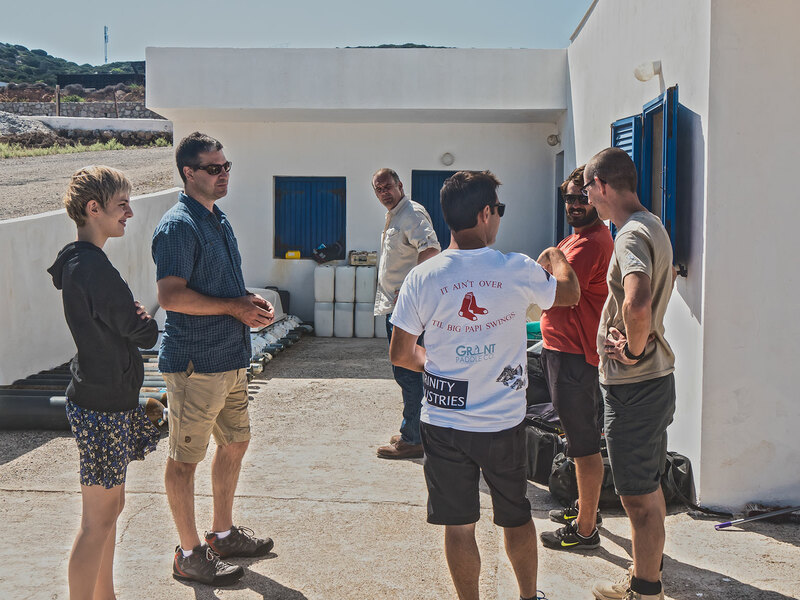 Our two dive boats from Crete and Alimos are in Antikythera, with the mother ship, MV Glaros due shortly, which is generously provided by the Aikaterini Laskaridis Foundation. 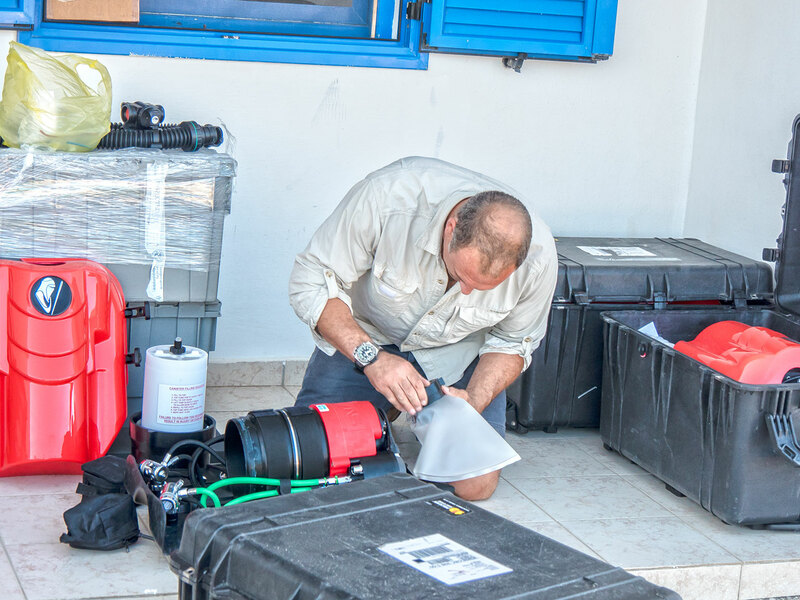 Thousands of kilograms of equipment and supplies have also been arriving, literally tonnes of material to support diving operations and the team for the next few weeks. 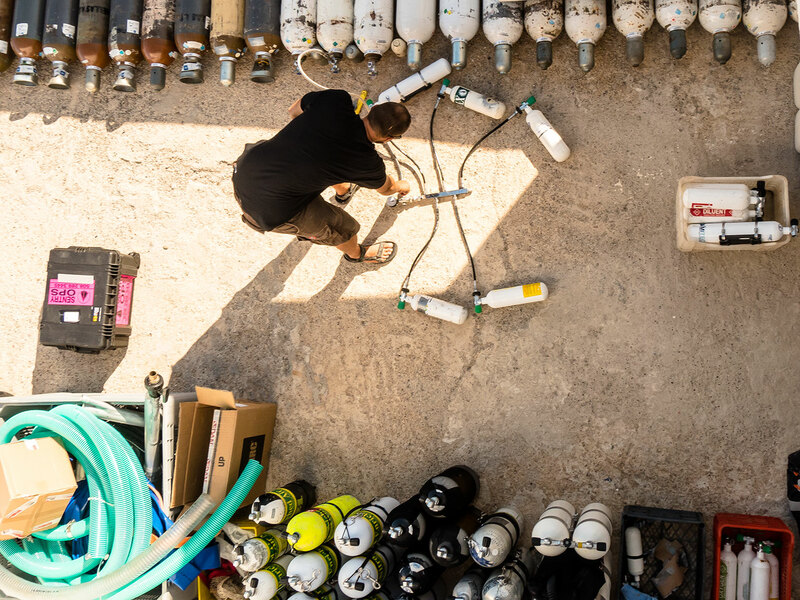 The main task for this week is preparation, ready for first dives on the wreck on Sunday or Monday, depending on the weather. Some may not realize how logistically demanding this project is, taking science to new limits on a number of fronts. 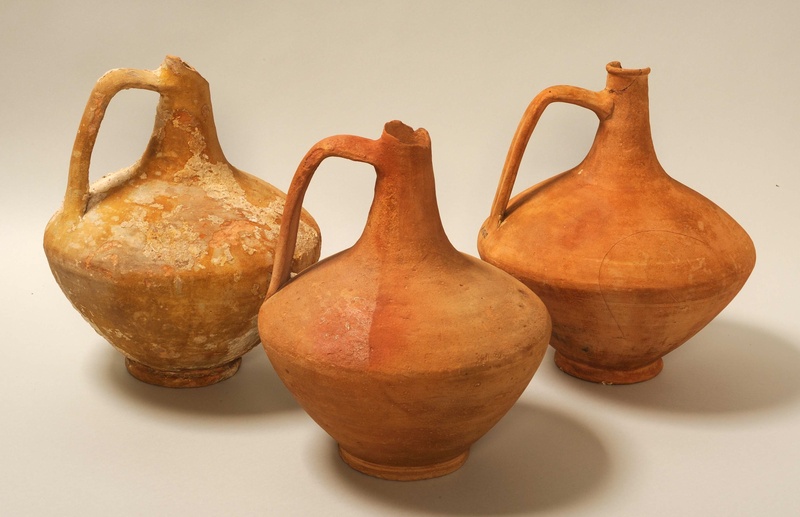 Will old artifacts reveal new secrets? 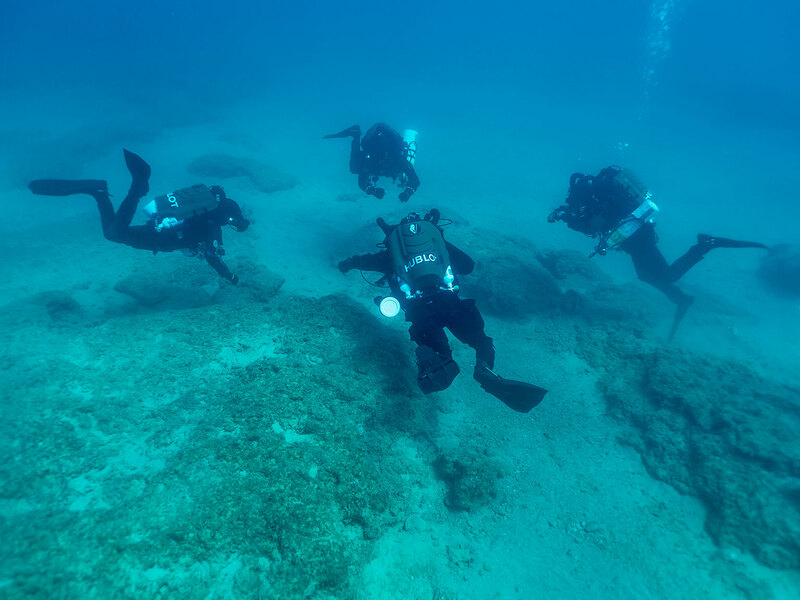 The Hellenic Ministry of Culture, Education and Religious Affairs has approved scientific analysis of Antikythera Shipwreck artifacts from the 1901 and 1976 salvages. 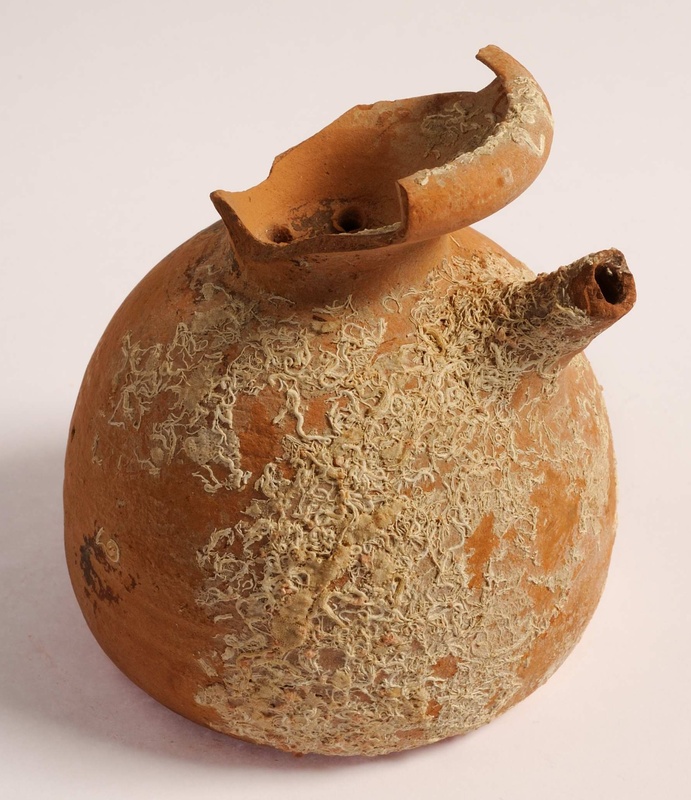 The first task is extracting ancient DNA in the ship’s luxury ceramic artifacts to determine their original contents. 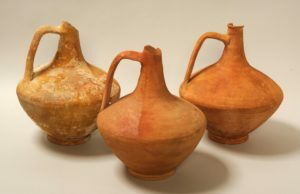 We will sample seven artifacts to start: lagynoi, olpe, and unguentaria recovered in 1901 and 1976; and a filter jar recovered in 1976. 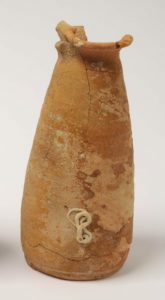 We will collect the samples from the jars this month, using a non-destructive technique recommended by forensic scientists in American police crime labs. We expect to have results by the close of 2015. If this pilot study reveals ancient DNA, then we will submit a new permit application to investigate many more artifacts from the wreck. Follow our expedition. Completely spam free, opt out any time.